Containment had improved from 5 percent to 17 percent by Sunday night, Cal Fire said. But with the fire having charred almost 96,000 acres by Sunday night, “‘extreme’ is not even the right adjective to use anymore,” said Chris Anthony, a division chief with Cal Fire. “It is just an understatement, because the fire is so explosive now in California,” Anthony said. 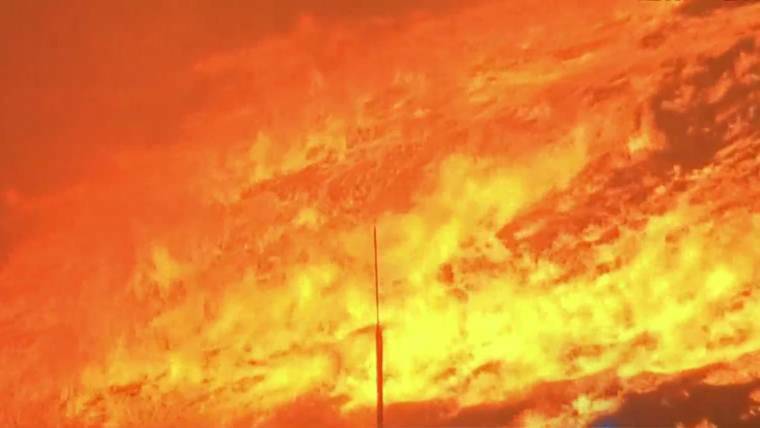 The fire has destroyed 874 homes or other structures and threatens 5,000 more near the city of Redding, the seat of Shasta County and an urban center of about 91,000 people. Around 40,000 residents have evacuated their homes. On Sunday night, authorities arrested two people on suspicion of looting homes that had been evacuated. Sixteen people have been reported missing since the blaze broke out Monday afternoon northwest of Redding, Bosenko said. Authorities are still investigating seven of those cases, he said. A vehicle’s mechanical failure is believed to have caused the fire, and years of drought and record heat waves fueled its staggering growth. Cal Fire Incident Commander Brett Gouvea told reporters Sunday that the fire was continuing to expand in remote, inaccessible areas, although it had not moved further into Redding. Gouvea added that firefighters were working hard to keep the fire from striking those areas. Almost 3,400 fire personnel were battling the fire, some of them on 36-hour rotations, with 17 helicopters, 334 fire engines, 68 dozers and 59 fire crews, according to Cal Fire. Officials said the Carr Fire was one of 17 major fires scorching 200,000 acres across the state. Also among them was the Ferguson Fire, which has torn through more than 54,000 acres around Yosemite National Park and killed a 36-year-old heavy equipment operator with Cal Fire on June 21. On Sunday, the Mariposa County Sheriff’s Office and the National Park Service said a Sequoia and Kings Canyon National Park firefighter died earlier in the day while battling the blaze. The park service identified the firefighter as Brian Hughes, 33, a four-year veteran and member of an elite hotshot crew. Hughes was working in an area with a large number of dead trees, one of which struck him, the park service said.